Trained and educated in California in radio and television production Ashley Gardner was born in northern England, immigrated with her family to Canada and raised on the shores of Lake Ontario, near Toronto. Ms. Gardner has been involved in the San Diego community since 1975 when she began her broadcast career as morning news anchor at KOWN-AM radio station in Escondido. Following a 5-year stint helping to build the new Fallbrook FM station, KAVO-FM, Ashley relocated to the city of San Diego in 1980 to fill the 7pm -11pm slot on KTTY Radio. After some time at KGB, KSDO, KIFM, KYXY and Y95 radio stations, she moved to television to host the local NBC weekly Saturday night show, “Weekend Magazine”. 1986 Ms. Gardner founded a video, film and multi-media production company to assist a multitude of non-profit organizations in telling their stories and produced hundreds of documentaries focused on social and environmental issues of our community. Much of her work can be seen on San Diego County Cable Television and other educational channels. 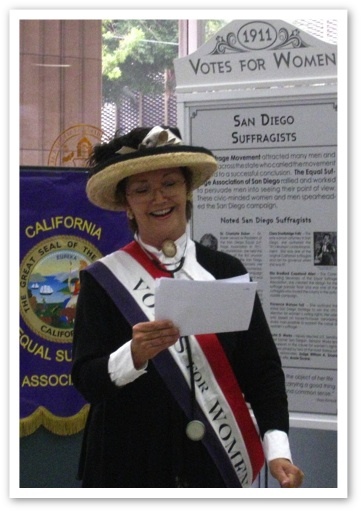 Having sold her production company in 2002, she spends much of her current time and energy managing and building the Women’s Museum of California currently located in the Golden Hill neighborhood of San Diego where she has been Director since 2007. Additionally, Ms Gardner can occasionally be seen on stage mainly in British drawing room comedies and farces with the Coronado Playhouse, most recently as Madame Arcati in Noel Coward’s “Blythe Spirit” resulting in a nomination for a “Lead in a Comedy” Aubrey Award. Spare time is spent happily occupied with the southern California vegetable and cactus garden she shares with her husband, Peter Meisen. Book Club reading, volunteering, traveling abroad and spending time with her two exceptional and handsome grandchildren, Maxwell and Shane, fills the rest. The Women’s International Center salutes Ashley Gardner for sharing her bountiful talents and her many good works, truly a Living Legacy!